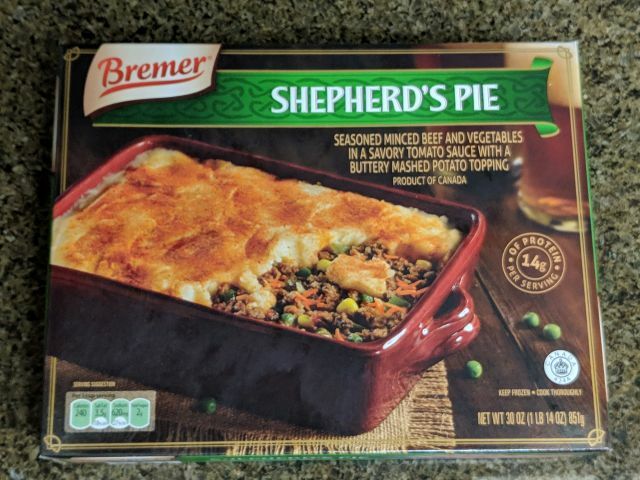 Bremer (Aldi) Shepherd's Pie features "seasoned minced beef and vegetables in a savory tomato sauce with a buttery mashed potato topping." I paid $5.99 for a 30-oz tray. 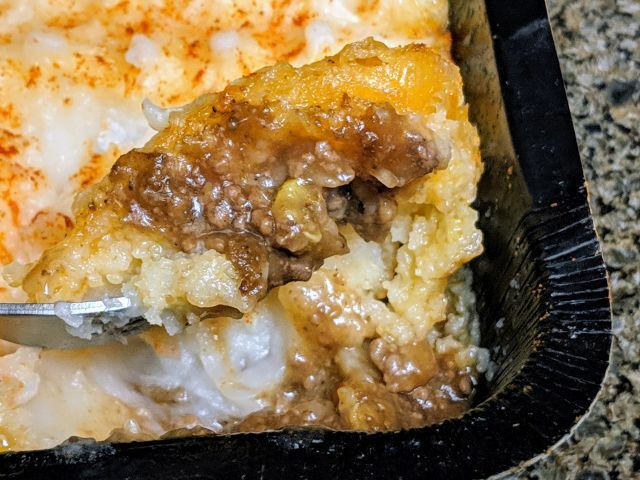 For whatever reason, shepherd's pie isn't all that big here in the US (at least as far as frozen food goes or maybe it's just my local supermarkets). I'm not sure why as mashed potatoes over what's basically a thick beef stew sounds great. Whatever the case, I spotted this at Aldi (Bremer is one of their private brands) and decided to try it out. 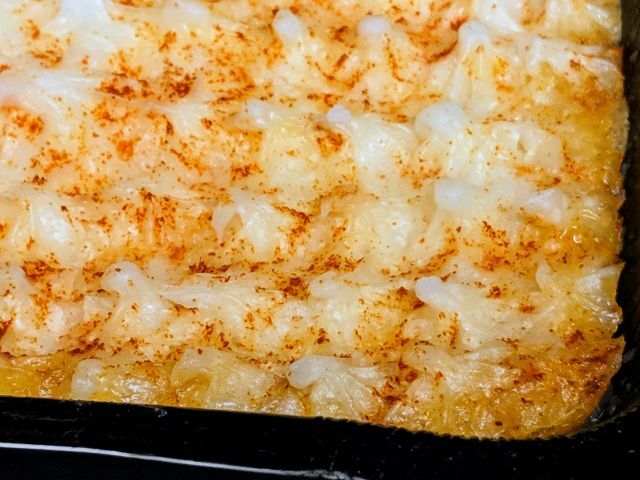 For visual effect, it looks like they pipe the mashed potatoes out with a cake decorator and sprinkled on some paprika to give it some color (I couldn't taste the paprika while eating it though). The mashed potatoes seemed to have been whipped smooth. It tasted good and went well with the beef and veggies underneath but wasn't all that buttery. There was a surprising amount of texture and crunch to the vegetables, which was a mix of peas, corn, and carrots. The accompanying sauce was flavorful and savory but, despite what it says on the box, there's not much tomato to it. Still, I liked it quite a bit. The beef was plentiful but a little grainy (like when you make ground beef tacos at home). Combined with the veggies, there's a nice contrast against the potatoes and I'd say the ratio between the filling and the potatoes was close to 50:50. 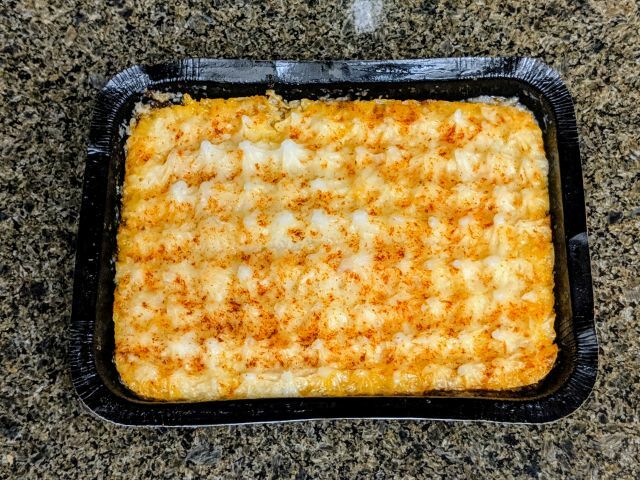 At the end of the day, Bremer / Aldi makes a really nice shepherd's pie and there's enough to share between two or three people. If you have any leftovers, it reheats nicely in the microwave.